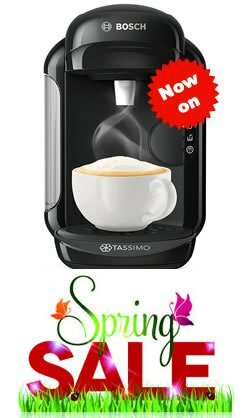 How to make the regular cup of coffee with this machine? How hot warming plate of espresso machine gets? Will Espresso come with lots of crema? Does it have a water tank or do you need to plumb it in to the water supply? Water reservoir is made with health standards (BPA)? What is the distance between the drip tray and the spout, i.e. how big a mug can you use? Where is the it made? Does this have a 3 pin plug? Does the Coffee Machine have two boilers for milk frothing? Can I use this in a kiosk to make around 100 drinks a day? Coffee has good mellow tones with no bitterness and a rich aroma. Instructions are clear with in-depth guidelines for making espresso. Frothing milk doesn't produce much volume. Steam wand gets very hot so the milk sticks onto it. 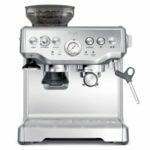 Sage by Heston Blumenthal is not only a top end Espresso machine maker, but their Barista Express model is a best seller. It’s an upgrade from the budget bean to cup coffee machines we have reviewed so far but if you are looking for the tastiest espresso you can make at home, then this bean to cup coffee machine is a great choice. 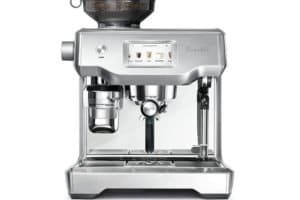 All of the Sage by Heston Blumenthal appliances are actually made by Breville who were established in 1932 in Australia; they not only make espresso coffee machines but also a huge range of kitchen appliances. Making great tasting espresso is art combined with science, Sage takes out the majority of guess work from the process and provides you with consistent tasting espresso every time. Grind size and grind amount are responsible for consistency and with this coffee maker you do not need to adjust/guess the size and amount to get perfect quantity. Burr grinder and removable water storage minimize the need to change and check while making espresso so overall making the process much easier. The machine has thermocoil heating system which regulates the temperature of water which results in flavored espresso. People mostly don’t care about how the machine looks as all they want is great tasting espresso, but with the Barista Express there is no compromise in the look department. The BES870BSUK is one of the finest looking espresso machines in the market without compromising the usability and output. The price may seem a little expensive but based on my coffee drinking habits, the machine will pay for itself in less than 4 four months, counting 2 x £2.50 espressos from Costa / Starbucks each day. Or, if you are still using Tassimo Pods, do you realise how much you spend a week on your coffee? Trust us, this coffee machine will save you money within 6 months! Heston Blumenthal is a top Michelin star chef and is renowned for quality and innovation. Heston firmly believes in the Sage bean to cup coffee machines, so much so that he has put his name on it. Here is what the big man has to say on the Barista Express. If you shop around you can get some great discounts on the Sage Barista Express, online has the cheapest deals and you can currently get a £110 discount at Amazon if you are quick. The Barista Express BES870BSUK is fully loaded and comes with lots of features so you can tailor your coffee perfectly to your personal tastes. Having an Integrated Conical Burr Grinder, you are able to choose the grind size and grind amount. The grinder is also easy to clean as the upper and lower burr grinders are removable and easy to disassemble. Having espresso is all about preferences, some people prefer coarse or very rough grind while some gus like me prefer a very smooth grind. This bean to cup coffee machine has an adjustable grind size, so no matter what your preference, this machine will have options grind to your perfect size. Again some people prefer to have a very strong latte while some like light coffee, you can adjust the volume of grind per shot. By Optimising the grind size you will get one of the best lattes you have ever had. This feature lets you select the size of shot you want, whether you want to make 1 or 2 cups. Using the filter button you can specify the size of dosing needed. Having to stand holding a portafilter while a machine grinds the beans is tedious and messy. The Barista Express has a cradle to hold your portafilter, which dispenses the right amount of dose directly and provides you with non-messy easy to use functions. Having the precise amount of grind is imperative, and the people at Sage/Breville knows this very well as they have provided the Razor Dose Trimming Tool for high precision exact dose and consistency. Having control of water temperature is critical for natural flavor of your coffee and the designers have not forgotten this feature. You can adjust the temperature to produce coffee to meet your exact taste requirements. Proportional Integral Derivative Control, it is an advanced technology to monitor the temperature to an exact point. Sage/Breville has implemented this to provide temperature stability as well as maintaining high precision temperature for optimum taste. Instead of using a ThermoBlock, it uses a Thermocoil. Thermoblock consist of two blocks glued together with a gasket; this block heats the water. Over time this glue is deteriorates and falls apart resulting in the breakdown of the machine. 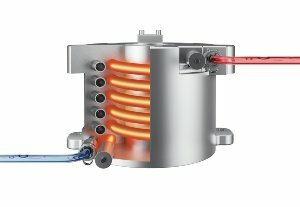 While as thermocoil has a single coil, controlled with the PID, resulting in more accurate and stable heat directly improving consistency of taste. Steam wand made with durable and top-notch quality stainless steel with 360-degree swivel action; it’ll give you effortless milk texturing. The days of having to stand near the espresso machine and wait for the water to heat up are gone! The Barista Express espresso machine comes with instant hot water; it can be used for pre-heating cups and making Americanos. To produce even extraction a low water pressure is applied, it gently expands the coffee grinds and ultimately results in an even extraction. This is one of the features which is responsible for the consistency of coffee. A dedicated special pressure gauge to make sure the grinding process is done at the right pressure. Very few machines in the industry provide such functionality but the Barista Express is one of the trendsetters with this function. BES870XL have pre-set quantity of one and two cups. There are options to override this volume manually to make sure you get the perfect shot for your latte. Coffee beans are filled with water and sometimes the grinding comes out a little damp. The dry puck feature will provide you with totally dry coffee by removing excess water from the coffee in the filter basket. Sturdy and top notch quality material. Has a storage compartment for cleaning tools. Find best priceWe have researched and compiled a general list of issues people have in mind before buying. It is not designed to make a regular cup of coffee, though you can make Americano from it by making two shots of espresso and then add the water from the reservoir. The result is a strong cup of regular coffee. It is not terribly hot, but it is quite warm so that you can put few cups on there and they’ll be sufficiently warm before your dose of latte. Crema entirely depends on the quality of espresso you’re using, based on the quality and the few cycles of settings adjustments will get you the perfect crema you needed. Sage/Breville provides this machine with one year of warranty. Sage/Breville kept BPA and other standards while making the this coffee machine. The distance is about 10.5cm. You could hold the mug at an angle if it is too tall. Sage is the European front for Breville (Australia). The machine manufacturing is probably contracted out to China under Breville’s quality control specifications. The build quality is mostly excellent. Yes the UK product ships with a UK plug for a UK power supply! Other country specific models come with the relevant country plugs. No, it’s a single boiler machine, even though it’s impressively fast to reach temperature. If you want a dual boiler machine, have a look at Heston’s Dual Boiler model in the range. Definately ‘no’! It is brilliant at making 1 – 4 cups over 20 mins or so, but it is not powerful enough for bulk orders. It only has one boiler so this in itself will make for slow processing – no espresso pouring and milk frothing at the same time. But it isn’t designed for commercial use – it is a brilliant home machine and makes the best coffee I have ever tasted but you will have queues out the door if you tried to make to order! Sorry! Below are links to instruction manuals for various DeLonghi ESAM models, if you have lost yours, hopefully this helps. 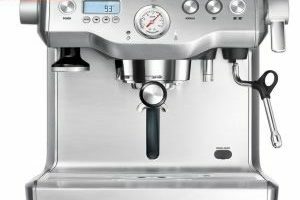 Find best price – £110 off at AmazonThe Sage/Breville Barista Express Espresso Machine is the home edition of those expensive café-style machines which cost around £3000, but although much cheaper, it still manages to provide the same experience of coffee at much lower price. The coffee machine is the highest selling in the market and delivers the best tasting espresso in super-fast speed. With great features like a grinder and water reservoir, the Sage by Heston Blumenthal coffee machine is a steal for just over £500. We would totally recommend buying this machine to anyone!